The U.S. African Development Foundation is committed to supporting individuals in marginalized communities that are bright, energetic and eager to do their part to generate income for themselves and their families. For over three decades, the U.S. African Development Foundation has been committed to supporting and funding marginalized groups that are otherwise on the fringe of society. Like many of the groups USADF supports, people with disabilities are ready to do their part. USADF has funded producer groups in Africa comprised of peoples with disabilities – and many of these community enterprises have flourished, due to the determination and capacities of their members. In Benin, a small country in West Africa, there are a few USADF funded enterprises that stand out. The Cove Rabbits is a small and growing business that cultivates rabbit meat for sale to the local community. In the early stages of rabbit cultivation, bunnies need a lot of individual attention, which is provided by the group members. Rabbits are then moved to pens which have been installed at mid-level to accommodate those who are wheelchair-bound. Nearly all facets of the rabbit production is comfortably conducted by people with disabilities. 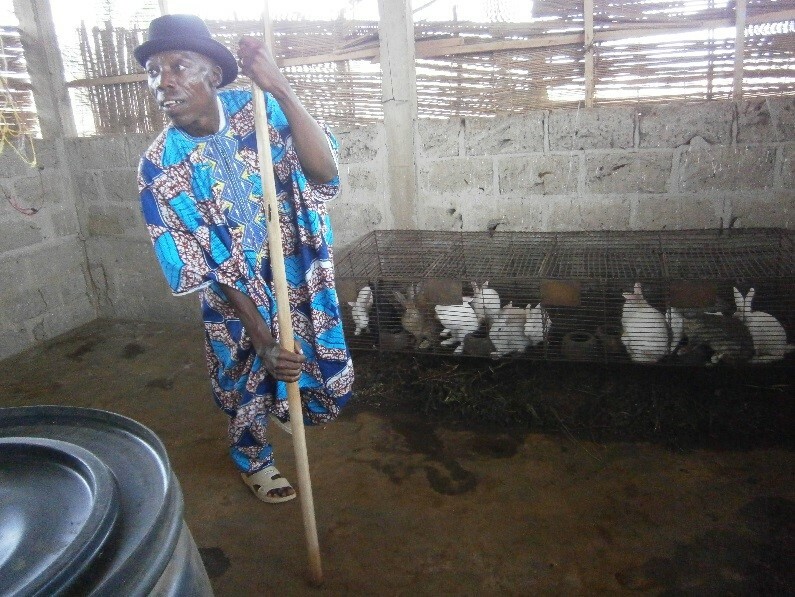 Not only are the group members cultivating rabbits collectively at the business facility, but they are also cultivating rabbits in their home, employing sons, daughters and other youth to complement the labor requirements. The U.S. African Development Foundation has also had good success in vegetable gardening and marketing operations, where individual plots are assigned to the disabled group members. Once again, this labor intensive operation can be well executed by individuals who are immobile. At Association Union Fait la Force des Personnes Handicappées in Benin, the group leader and Chief Marketing Officer is also disabled, using a re-fitted motorized cart to visit clients and deliver products to local restaurants and markets. In Zambia, USADF is funding a group of blind and partially-sighted women who are turning marginal income-generating activities to a profitable and sustainable business. Using a revolving loan fund, these entrepreneurial women are starting their own small businesses, many of which sell rice, fresh fish and vegetables, and pay back the loans in small installments each month. These women are empowered, despite their disabilities, to be independent, run a business and support their families. And finally, in Niger’s capital of Niamey, USADF, in partnership with Femme Handicapee Pleine d'Experience, is improving the standard of living for over 150 women with disabilities. This group of women engage in income-generating activities, such as selling processed grain meal in mobile kiosks, and are fully involved in the cooperative’s decision-making and financial planning. One thing USADF knows for sure, these individuals who face physical limitations are boundless in their enthusiasm, drive and smarts to generate a livelihood for themselves and their families.